Massage Therapy/Myofascial Therapy is utilized in our office in conjunction with Chiropractic Care to treat the whole body. Chiropractic care focuses on the bones, joints and nerves where Massage Therapy focuses on the soft tissues like muscles, tendons and ligaments. 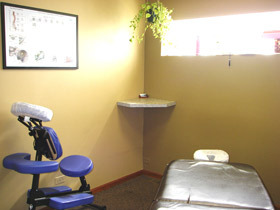 At Midwest Chiropractic Care Center, we have found that by combining the two forms of treatment, our patients improve much faster. We have seen better long term outcomes and reduced patient visits as a result of combining Chiropractic and Massage. Post surgical rehabilitation Massage therapy relieves stress. It is thought to help the body’s stress response by lowering levels of hormones such as cortisol. I am looking forward to meeting you in person and discussing how we can help you get on the road to wellness. Give our Mt. Greenwood chiropractic office a call today to schedule your appointment.